The NS Tri-Action capo in black assures buzz-free, in-tune performance at any fret. The patent-pending Tri-Action geometry reduces the force required to open and close the capo and applies even tension regardless of neck profile. Combined with the micrometer tension adjustment and direct horizontal pressure, the Tri-Action Capo virtually eliminates pulling the strings side to side and the need to retune during use. Additionally, the lightweight aluminum construction adds negligible weight to the neck of the instrument. The capo features an integrated pick holder and is a Ned Steinberger design. Planet Waves products promise to be the most innovative professional musician’s tools available. Our diverse capo line is no exception. Many of our groundbreaking models are the result of a productive joint effort between famed designer Ned Steinberger and Jim D’Addario. 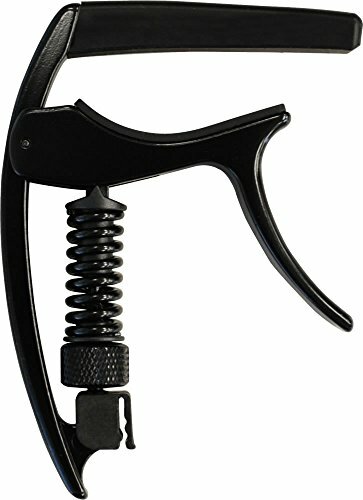 No matter what style of capo you prefer, Planet Waves has the capo for you. Planet Waves, part of the D'Addario family of brands, is known for innovative, problem-solving, quality musical accessories. Planet Waves offers a complete line of award-winning accessories including cables, picks, tuners, capos, straps, humidifiers, maintenance tools and more. Hosa F5S-H6 CAIG DeoxIT FaderLube 5% Spray, 5 oz.